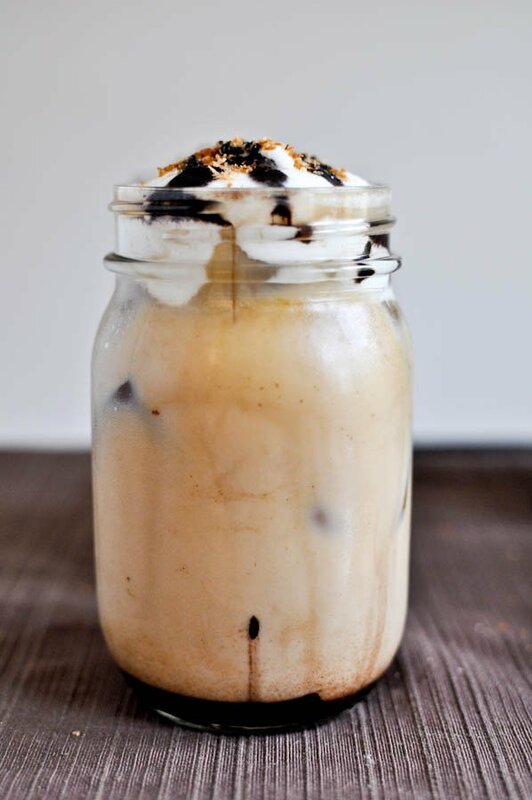 Homemade Mocha Coconut Iced Coffees. When I was a freshman in college, I once ventured to Starbucks. This wasn’t a frequent happening because 1. I didn’t like coffee whatsoever except when loaded with tons of crap and heavy cream… sort of like now, and 2. there wasn’t a Starbucks on campus. Clearly I went to college in the stone age. Two of my FAVORITE ingredients combined?! Who cares if I didn’t like coffee – at any rate I was ordering white chocolate mocha frapps once or twice a year, drinking half and trashing them. With mocha coconut I would FOR SURE finish it. Holy dreamboat. I slurped it to the bottom. I almost wet myself from excitement. I literally almost wet myself from drinking 48 ounces of diuretics and sugar. Starbucks became my new favorite place. But it wasn’t like I was there all the time. It wasn’t on campus + I didn’t have a car + I still didn’t love coffee + coffee made (and still makes) me have humongous anxiety/buzz/jitters issues. I feel like a freak on drugs. Until one day I walked in and… it was off the menu. What the what?! I couldn’t believe my own eyes because I figured it HAD to be a popular drink. Seriously, I was jacked. If I had any semblance of a backbone, I may have called and complained. Instead I just didn’t go to Starbucks for like six years and developed a nasty rice krispy treat addiction. Not even joking. These babies were the size of my head. Imagine my delight when my cousin told me last week that she had a mocha coconut frappucinno! YES. My prayers had been answered. Now… I just needed to figure out how I could add $6.00 to my daily food budget and an extra 800 calories. Or… just make my own. I’m sure the regular mocha coconuts have coconut syrup in them, so this isn’t quite as coconutty, but I can promise that is gets 98% close. The best part? COCONUT MILK WHIPPED CREAM. I knew that Ashley had made this before and when I texted her in a frenzy from the grocery store, she assured me it would work. And that it did. 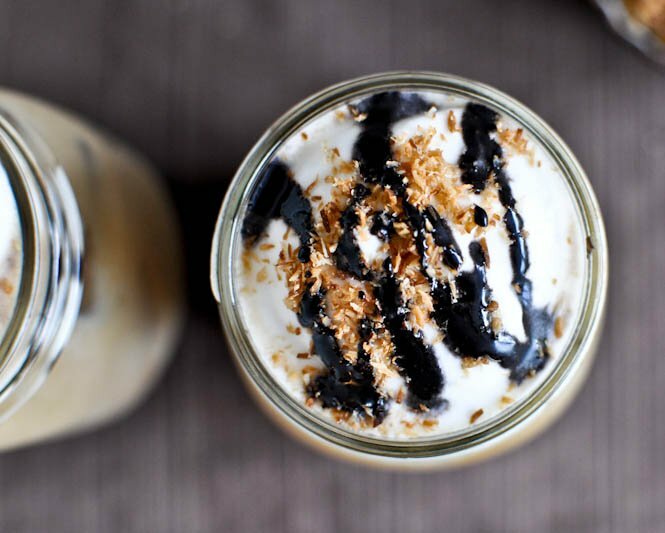 We have a layer of chocolate fudge, a pour of caffeine, a healthy glug of coconut milk, a blob of coconut whipped cream, freshly toasted coconut and a chocolate fudge drizzle. Oh mylanta. Just make sure you use a deliciously flavored coffee, such as fudge brownie or macaroon to heighten your experience. And don’t use something wacky like strawberry. Because then it will just taste… weird. 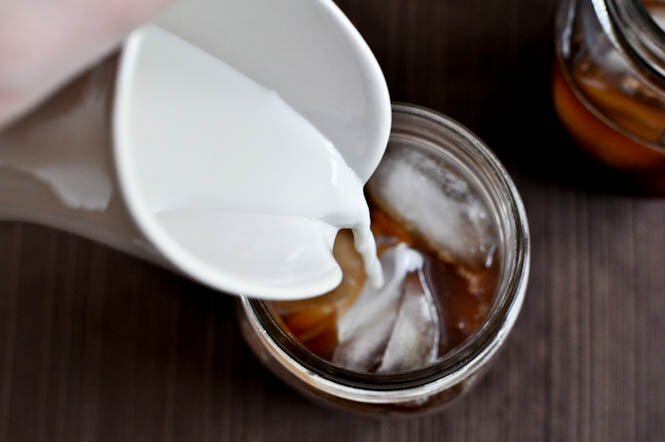 Brew coffee and let cool – this can work with leftover morning coffee, or I suggest making some at night and once it cools, putting it in the fridge overnight. However you want to do it, as long as you have cold coffee, you are set! I still have not tried cold brewed coffee but I know I need to. In the bowl of your electric mixer (or using a bowl and an electric hand mixer), add cold coconut milk and sugar. Beat until peaks form and you have the consistency of whipped cream – about 6 minutes. Mine did not get quite as thick as regular whipped cream and was still a bit runny – but I have no patience. It was still delicious. Fill the bottom of your glass with 1-2 tablespoons of chocolate syrup, then add ice cubes. Pour in coffee, then coconut milk, then vanilla, then sugar and mix well with a spoon. Add in some toasted coconut if you wish. Add 1-2 tablespoons of whipped coconut cream on top and another tablespoon or 2 of chocolate syrup. Drink up! I’m so thankful I stumbled across this on Pinterest, can’t wait to give it a try tomorrow morning! Yes I got one from Hawaii and now I can’t get enough Coconut, mocha and coffee. I like coffee. You are my kind of girl. I will give this recipe a try. Loved your article. I think you’re my soul mate! I didn’t go near coffee until my husband ordered a mocha coconut frappuccino from Starbucks two years ago and I took that first amazing sip! Since then, I’m a coffee freak! I tried to concoct a recipe for them on my own, but it just didn’t work, I think this one will! Thank you!!! Hint if anyone wants a stronger coconut flavor – sub half (or all) of the vanilla extract for coconut extract. I love coconut so so much and it really helps give this an extra coconutty kick! OMG. This looks so good. I get hives when I drink coffee and I have to be dairy free. I hope all you coffee drinkers out there appreciate the luxury of being able to drink coffee. I do sometimes, but I suffer. I love the mason jars. This looks so refreshing! I want one now! Great idea! Thanks for sharing!!! 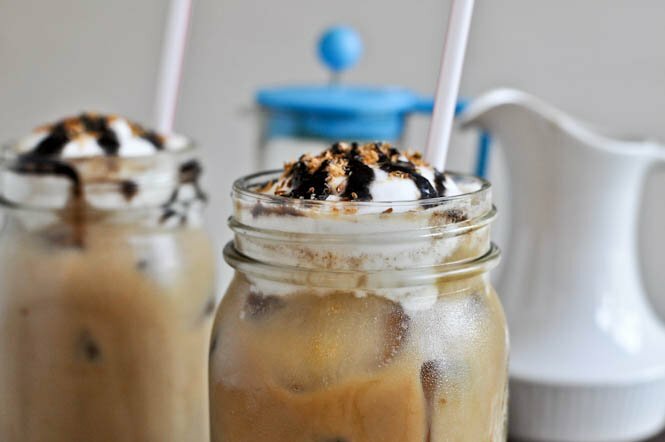 I had featured U in the post of Beat The Summer Heat With These 7 Homemade Iced Coffee on AllFreshRecipes, if u have any other recipes want to be featured. let me know. 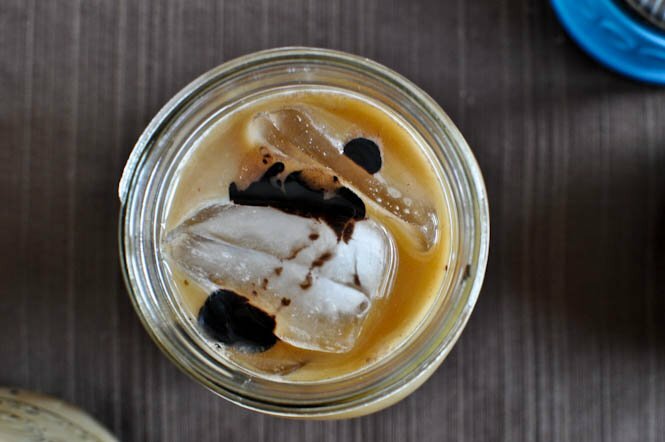 Pingback: 25 Delicious Coffee Recipes - Lattes, Frappes + MORE! I am in love with this post!!! You are hilarious, I was sitting here at home with my 7 month old exhausted and craving coffee like a crazy person. I was debating on going to Starbucks but running to Starbucks childless was so much faster now with a baby it takes forever. And the closest Starbucks doesn’t have drive-thru. Hello??? I don’t want to put pants and shoes on haha. I am making this right now! I’m going to put my baby down for a nap and then I’m going to drink this under my blanket so my husband doesn’t see it and he will want a sip hahaha. thank you so much for this delicious recipe!!!! I guess I can skip the milk the next time I made coffee and put in some mouth-watering coconut milk, great recipe!